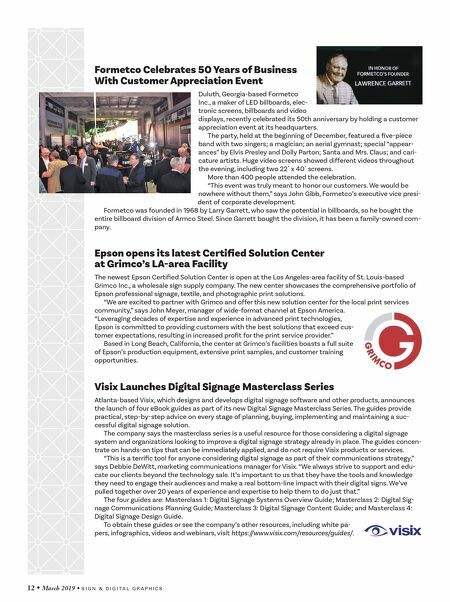 12 • March 2019 • S I G N & D I G I T A L G R A P H I C S Formetco Celebrates 50 Years of Business With Customer Appreciation Event Duluth, Georgia-based Formetco Inc., a maker of LED billboards, elec- tronic screens, billboards and video displays, recently celebrated its 50th anniversary by holding a customer appreciation event at its headquarters. The party, held at the beginning of December, featured a five-piece band with two singers; a magician; an aerial gymnast; special "appear- ances" by Elvis Presley and Dolly Parton; Santa and Mrs. Claus; and cari- cature artists. Huge video screens showed different videos throughout the evening, including two 22´ x 40´ screens. More than 400 people attended the celebration. "This event was truly meant to honor our customers. We would be nowhere without them," says John Gibb, Formetco's executive vice presi- dent of corporate development. Formetco was founded in 1968 by Larry Garrett, who saw the potential in billboards, so he bought the entire billboard division of Armco Steel. Since Garrett bought the division, it has been a family-owned com- pany. Epson opens its latest Certified Solution Center at Grimco's LA-area Facility The newest Epson Certified Solution Center is open at the Los Angeles-area facility of St. Louis-based Grimco Inc., a wholesale sign supply company. The new center showcases the comprehensive portfolio of Epson professional signage, textile, and photographic print solutions. "We are excited to partner with Grimco and offer this new solution center for the local print services community," says John Meyer, manager of wide-format channel at Epson America. "Leveraging decades of expertise and experience in advanced print technologies, Epson is committed to providing customers with the best solutions that exceed cus- tomer expectations, resulting in increased profit for the print service provider." Based in Long Beach, California, the center at Grimco's facilities boasts a full suite of Epson's production equipment, extensive print samples, and customer training opportunities. Visix Launches Digital Signage Masterclass Series Atlanta-based Visix, which designs and develops digital signage software and other products, announces the launch of four eBook guides as part of its new Digital Signage Masterclass Series. The guides provide practical, step-by-step advice on every stage of planning, buying, implementing and maintaining a suc- cessful digital signage solution. The company says the masterclass series is a useful resource for those considering a digital signage system and organizations looking to improve a digital signage strategy already in place. The guides concen- trate on hands-on tips that can be immediately applied, and do not require Visix products or services. "This is a terrific tool for anyone considering digital signage as part of their communications strategy," says Debbie DeWitt, marketing communications manager for Visix. "We always strive to support and edu- cate our clients beyond the technology sale. 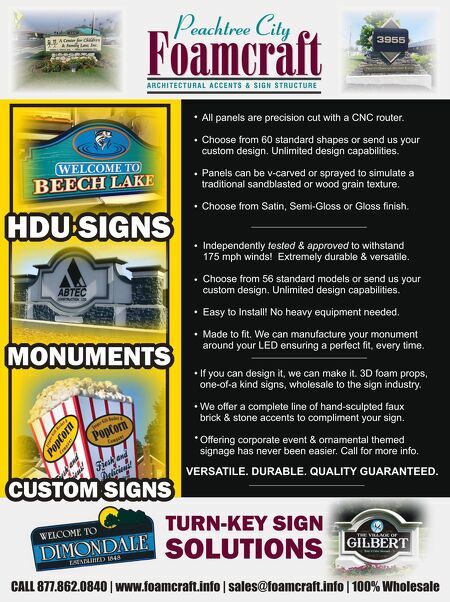 It's important to us that they have the tools and knowledge they need to engage their audiences and make a real bottom-line impact with their digital signs. We've pulled together over 20 years of experience and expertise to help them to do just that." The four guides are: Masterclass 1: Digital Signage Systems Overview Guide; Masterclass 2: Digital Sig- nage Communications Planning Guide; Masterclass 3: Digital Signage Content Guide; and Masterclass 4: Digital Signage Design Guide. To obtain these guides or see the company's other resources, including white pa- pers, infographics, videos and webinars, visit https://www.visix.com/resources/guides/.